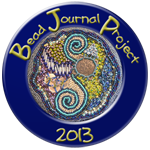 I am so happy to be involved with the Bead Journal Project again for its 6th year! I have been involved with it since the very beginning, but I've had life happen a few times during these years. Last year, I knew I would be delayed in getting started, but I signed up anyway, thinking that I'd eventually catch up. Didn't happen. Oh well. I'm charged up and ready to go this year, and I've decided to try something completely different: for a number of years, I've been intrigued by projects that combine bead embroidery with bead weaving. Many of you know that I've been working on finishing up my second e-book, called Some Assembly Required, which covers the use of bead weaving to embellish bead-embroidered cabochons, and to create bridges between these cabochons to form a finished piece. 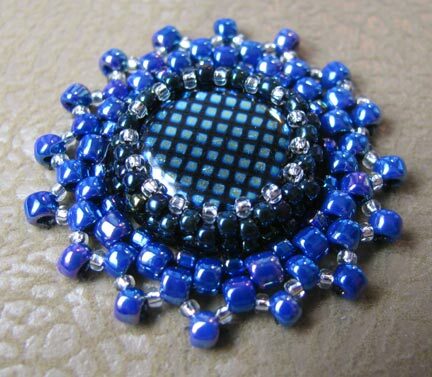 Well, my new idea for this year involves using bead weaving patterns to surround and enhance those cabochons in the form of fancy bezels and surrounds. I used a beautiful peacock on black Czech bead that I bought from The Best Beads Shop as the center. In fact, all of my pieces this year will use the same beads as cabochons so that I'll have a coherent color palette to work with at the end of the year for constructing a new necklace. Yay!! I'm so psyched to get going with the next! Excellent, Cyndi! I love your enthusiasm, and have always enjoyed seeing what you do next for the BJP. I missed you last year and am really glad you're back... especially with such a great idea/plan for the year. #1 looks lovely! Cyndi, yay!!! 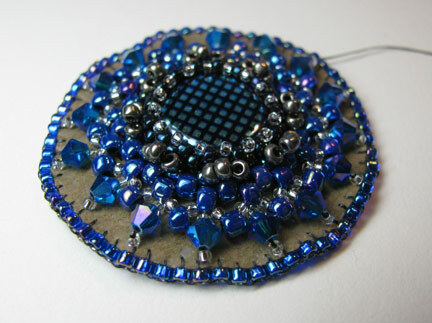 I love that you're combining bead weaving with bead embroidery. I've started to do some of that too, and it's really fun. How's your second book coming along, by the way? I've absolutely loved every chapter I've read so far. Beautiful first piece for January! The colours are so vibrant = delicious! What a pretty piece! I am looking forward to your collection growing. Very pretty Cindi. I love the combination of the weaving and the embroidery.